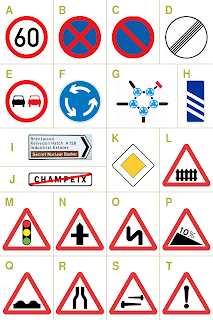 Here are examples of signs from the British road signage system. They were designed in 1963 by Jock Kinneir and Margaret Calvert. This is a visual language that most of us are familiar with. The system uses key indicators that tell us how to behave/react to what we see, for instance imagery placed in a triangle is warning us of a potential danger or a situation that we need to be wary of and prepare for. Who decided that a triangle should mean such a thing? This is an example of how we collectively agree on the meaning of something, it is an example of meaning becoming detached from seeing, of abstraction, of language.